View cart “Greenspeed GT20” has been added to your cart. The Magnum is the 1st recumbent trike to have a seat which is adjustable for height. Plus it is adjustable for angle as well. BRC: This trike with a 400 lb. capacity is designed for the larger rider, but you don’t have to be big to ride it. The mesh seat is adjustable for angle and height. 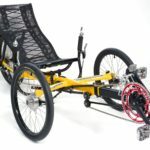 GREENSPEED: The Magnum is the first recumbent trike to have a seat that is adjustable for height. Plus, it is adjustable for angle as well. The seat height is adjustable from 12” to 17” and both adjustments are with Quick Release levers. Thus, the rider can choose the seat height to suit ease of entry and exit, the riding conditions, and personal preference – low for speed and high for visibility in traffic. Some riders may find they need the seat high at first to help get them on and off the trike. Later, as they become fitter and lose weight, they might find they can lower the seat and take advantage of the lower centre of gravity. This gives better cornering and road holding. Wind tunnel tests show that the lower seat is 2 MPH faster at 25 MPH. Many people have said that it is not possible to build a trike that is suitable for road as well as off road. Others have said, you must have suspension to give a smooth ride. However, this increases the weight, adds complication, and cost. Well, the Greenspeed Magnum breaks the mould in trike design! 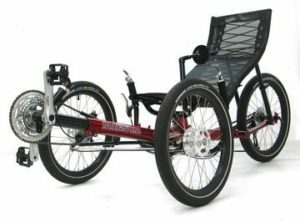 No longer is it necessary to agonize between the choice of a high seat trike for off road, or a low seat trike for on road, suspension or non-suspension, disc brakes or drum brakes, or a heavy, low performance trike to take your weight. Now, for off road use, you need a high ground clearance and low gears, yet for road use you need high gears and good road holding. The Magnum has a massive 5” of ground clearance, yet with the seat low, and the cambered wheels, it has outstanding road holding. Plus, the 9-32 Gold Ace cassette, combined with the 52/42/30 triple crankset, gives a very wide range of gears, from 19” in bottom to 116” in top gear – a range of over 600%! So, you can easily go fast or slow.